We are moving from vintage printables in the kitchen to colorful and modern bathroom art printables. Adrienne created four free printables that she is sharing on her site that are a great way to add fun color (and important reminders) to your kids bathrooms. 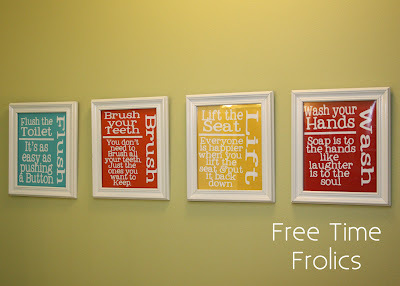 You can download all four of the free bathroom printables over at Free Time Frolics. These are adorable. I saw something like this on pintrest and have wanted them ever since. Thank you so much.